Elba is an elegant chair whose linear design conveys a sensation of lightness, while ensuring total relaxation. Inspired by the classical deckchair, its rigid structural elements are offset by a low-slung seat in select hide leather of ample dimensions which accompanies the body shape. Destined, in the course of the years, to gradually conform to the body shape, Elba becomes the faithful companion of relaxing moments, its hide leather testifying to the time spent together: marks and scratches are impressed on the leather surface like recollections, to confer a personal and timeless value to an object whose significance is destined to go far beyond that of its mere functional value. Materials are of an understated and timeless elegance: the hide leather has to be carefully selected owing to its considerable dimensions. The clearly visible longitudinal creases are unique to each hide and a sign of its authenticity. 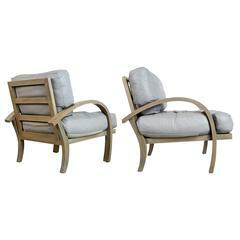 Available with or without footrest. 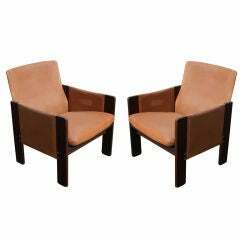 Armchair's dimension: cm 60 x 100 x h 70 Made in Italy. 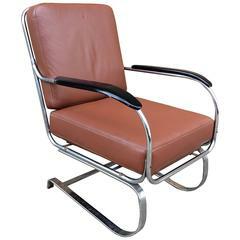 1940s, Machine Age, lounge chair by KEM Weber for Lloyd with cantilever, tubular chrome frame with wood lacquered armrests and newly upholstered leather cushions.